Do you like animated movies? 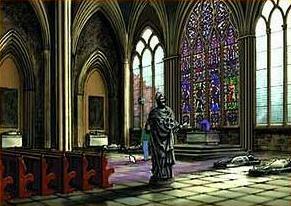 If you are answer is yes, then you are going to love the graphics of Broken Sword: The Shadow of the Templars (released as The Circle of Blood in the U.S.A.). Although the screen resolution is fixed at 640x480, the graphics look stunning. Tiny details, that a casual onlooker may not even notice are what breathes life into this game. You will not encounter a single completely static screen, oh no. There is always something moving – people in the background, a cat sleeping in the sun, foliage moving in the wind... The developers clearly paid a lot of attention to details and the overall mood set by the graphics. And what a great mood there is! Graphics, being cartoony as they are, disguise a complex and dark story. 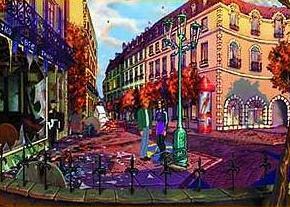 The music in Broken Sword is also very nice, even though it is subtle. The soundtrack mainly consists of orchestra work. Sometimes you won’t even notice the music, but it adds so much to the atmosphere. One particularly nice touch is that certain music plays when you discover an important clue. Now, let’s get into the main reason you will want to play this game: the story. You will find yourself in the shoes of George Stobbart, a law student from California, who is having a vacation in Paris. The vacation is, however, ruined by a clown, who bombs the café you’re sitting in. So, the place goes SPLODEY, but George manages to survive the explosion. What the hell is going on and why are you putting that clown nose into your pocket? Lovely reporter/photographer Nicola “Nico” Collard will help you in answering those questions (and more). Without giving anything away, I am just going to tell you that the story revolves around Templars, the Holy Knights (Warrior Monks, if you like) and it’s toying with the idea that they still might exist, under the name of Neo-Templars. Remember to save your progress often. 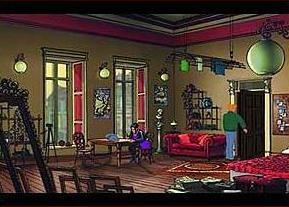 While Broken Sword features a captivating story, you can die at a few points of the game if you make a mistake. Most puzzles are inventory-based. They require a lot of talking, searching, and a brain that can think logically, but in a creative way. One of more noteworthy creative brainstorming products is the Stobbart Stick-Towel. A neat little invention, I have to add. Throughout the game, you will encounter a variety of characters. 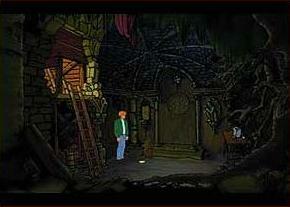 From sunny Spain to eerie Templar catacombs, Broken Sword has a lot to offer. There are inspectors, clowns, Templars, pretty girls, and some guys who want to kill you. I guess a game cannot go without that little detail. Every single character has a strong personality and it’s really hard to hate any one of them. One thing that will make you never forget the game is humor. Broken Sword is packed with heavy sarcasm and funny scenes that will make you want to replay the game over and over again. 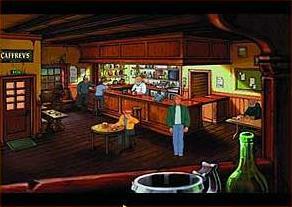 Pure Stobbart humor is a trademark of the Broken Sword games, something that makes the series unique and incredibly pleasant to play. 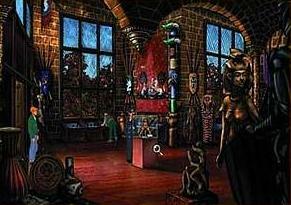 In the end of it all, Broken Sword: The Shadow of the Templars is a one-of-a-kind game that will provide you hours and hours of sheer fun, and also make you learn a few things. Travel the world, start an urban myth or two, discover a dark secret... The trailer doesn’t lie. This game rocks.